Leading Manufacturer of pvc bag filter housing, wound filter cartridge, disc type filter, hygienic filter housing, pvc cartridge filter housing and cartridge filter housing from Ahmedabad. PVC Bag Filter Housing provide an economical alternative to stainless steel. This product are designed for high flow rates and high sediment holding capacity. Its range provides filtration solution for a broad variety of fluid applications in the process industry. They are particularly useful for filtering large volumes of high viscosity liquids. Known in the industry as a prominent manufacturer and supplier, we are engaged in offering Wound Filter Cartridge system. 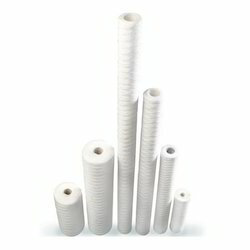 Wound filter cartridges are manufactured using a high speed, continuous wind process which creates a superior one-piece filter with hundreds of diamond shaped tunnels that get progressively smaller from the outer diameter to the core. Finer particles are progressively trapped as fluid travels to the centre of the filter allowing for much greater retention capacity than that which is associated with straight surface filter media of the same dimensions and porosity. 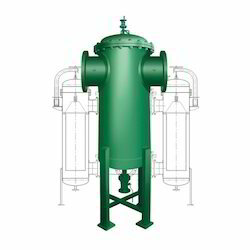 The disc type self-cleaning filter is constructed of filter housings, filter elements, and drain valve. It also has a pneumatic cylinder and timer-based drain valve. Filter housings can be offered in various materials of construction such as various grades of stainless steel, carbon steel and alloy metal. Filter elements can be offered with wedge wire, sintered multi-layer wire mesh, plain wire mesh and sintered metal powder configuration. 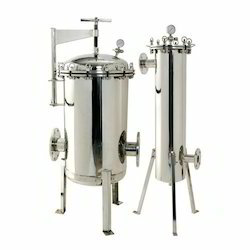 They are selected based on the requirement of filtration quality. A spring-loaded cleaning disc moves up and down inside the filter screen and removes collected contaminants. The filtrate flows from top to bottom, and from inside of the screen to outside. The contaminants that are collected on the screen are easily removed and evacuated to the collection chamber. On the down stroke, any remaining contaminants are driven downwards to the collection chamber while on the upstroke, the cleaning disc removes contaminants from the screen surface. Collection and removal of the contaminant from the fluid being filtered, without any interruption in the operation. We feel proud to introduce ourselves as the leading manufacturer and supplier of Hygienic Filter Housing. Our offered hygienic filter housing is manufactured using utmost grade components and innovative technology under the guidance of our skilled professionals. The offered hygienic filter housing can be customized as per requirements of our customers in various sizes, designs and specifications. 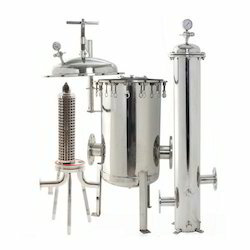 To deliver qualitative hygienic filter housing to the customers, this product is tested on several quality parameters. Contaminated fluid enters the housing and is distributed evenly around the filter cartridges. Filtration takes place from outside to inside. Solids are collected on the outside of filter cartridges & clear filtrate is collected at outlet. Known in the industry as a prominent manufacturer and supplier, we are engaged in offering PVC Cartridge Filter Housing system. The PVC Cartridge Filter Housing system provides an economical alternative to stainless steel. It is made of durable, corrosion resistant PVC and suitable for low pressure applications. The parts are once-molded and standardized with easy installation and maintenance. Band clip lid style for easy use. We are a leading manufacturer and supplier of Cartridge Filter Housing system. The cartridge filter housing system is a simple unity disassembly for easy cleaning and cartridge replacement. The head and the unit centre post keep the cartridge firmly in place. All the parts of the cartridge filter housing system are made of stainless steel with a sanitary ferrule type inlet, outlet and seals for cleaning which include ball valve for venting. Accommodates 10", 20", 30", 40", 50” & 60” long filter cartridges. Bag Filter Housing is designed for optimum filtration performance. 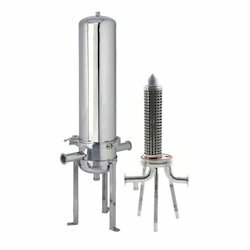 Its range provides filtration solution for a broad variety of fluid applications in the process industry. 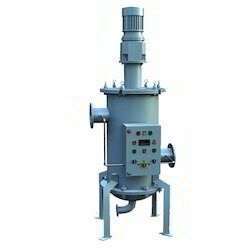 They are particularly useful for filtering large volumes of high viscosity liquids. 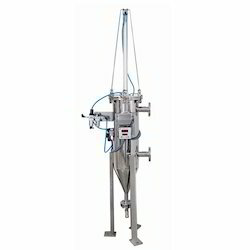 Bag filter is constructed of filter housing, filter bags, internal cage to support bags, positive sealing arrangement, & choice of end connections. The internal support ensures bags will not burst as high differential pressures build up during operation. 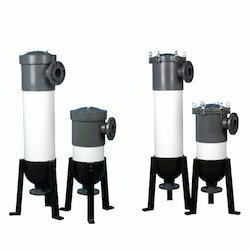 Widely acclaimed as an efficient and effective manufacturer and supplier, we are engaged in offering Basket Filter and Strainers. The problem of unwanted materials in a pipeline is a never ending one. Dirt, foreign matter or even clumps of the product can clog or damage pumps, spray nozzles and condensers. Basket filter and strainer removes unwanted particles from the pipeline flow. If the particle to be removed is not visible to the naked eye, the unit is filtering and if the particle is visible, the unit is straining. Diverting valves for efficient filtering. Unfiltered liquid enters the basket housing and passes down through them. Solids are retained inside / outside of basket depending upon design and are removed when the unit is serviced. Auto Back wash type self-cleaning filter is constructed of filter housings, filter elements, drain valve, auto back washes valve and PLC controller. Filter housings can be offered in various materials of construction such as various grades of stainless steel, carbon steel and alloy metal. Filter elements can be offered with wedge wire, sintered multi-layer wire mesh, plain wire mesh and sintered metal powder configuration. 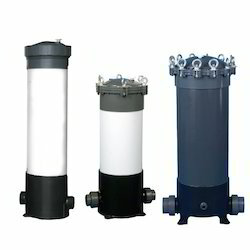 They are selected based on the requirement of filtration quality. Auto Back wash type self-cleaning filters work in a flow direction of outside to inside. Unfiltered fluid enters into filter housing through bottom tangential inlet connection. Contaminants are deposited on the outer surface of filter elements and clean filtrate passes through inside diameter of element and removed through the top tangential outlet. Users can set their differential pressure data within control panel. Once the differential pressure across the system reaches the pre-defined level of pressure drop, inlet and outlet valves shut down and the drain and backwash valves open for defined interval of time. During this process, debris deposited on outer surface of element shall be drained out and collected through bottom drain. This cycle continues as per pre-defined settings and process requirements.Auto Back wash type systems are available with multiple filter elements, wherein one element is in use and the other can be cleaned at the same time. This will help to have uninterrupted flow of the fluid. Looking for Cartridge Filter Housing ?